Thursday, 20 of May in the Municipal theatre of Agios Athanasios, start 20:30, free entrance. 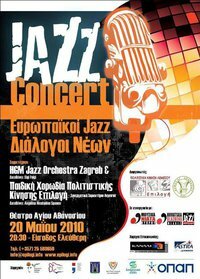 Bewteen 19 and 24 of May 2010, the Childern Choir of Cultural Movement Epilogi of Limassol will host famous big band “HGM Jazz Orchestra Zagreb”, from Croatia. The HGM Jazz Orchestra Zagreb will present a wide range of pieces arranged for full twenty-members big band. HGM Jazz Orchestra Zagreb is working under the patronage of Jeunesses Musicales Croatia and gathers the youngest generation of Croatian jazz musicians. The musicians are between 20 and 30 years old. The aim of the orchestra is promotion of the young musicians, their high education in jazz music as well as presenting of jazz music, especially to the young audience. For the 6 years of its existence, the Orchestra gave over 170 concerts in Croatia, Austria, Sweden, Belgium, Serbia, Slovenia, Italy, FYROM, Turkey, USA and Indonesia. HGM Jazz Orchestra Zagreb is one of the most famous European Youth Jazz orchestras that apart of its mission to promote the jazz music among young people, also works at high artistic level and represents Croatian culture abroad. The Cypriot part of the program will be prepared and performed by Children’s Choir of Cultural Movement Epilogi – Limassol Cooperative Savings Bank, under the baton of famous choral conductor Mrs. Angelina Nicolaidou Spanou. The Children’s Choir “Epilogi” – LCSB will perform the “A Little Jazz Mass” by Bob Chilcott. It is, no doubt one of the most successful Cypriot children’s choirs, with hundreds of performances in Cyprus and abroad. It was founded in 1996 and functions in two departments, Children Choir and Music workshop and has about 100 members aged from 7 to 16 years. It collaborated with Cyprus Symphony Orchestra, Symphony Orchestra of ERT, Budapest Concert Orchestra and maestros G. Pylarios, Notis Georgiou, Francois Duchamp, Sotiris Alevizos and Viatcheslav Volich. Event created by Cultural Movement “Epilogi” – ??????????? ?????? “?????? ?” on facebook and submited by Nenad Bogdanovic to OnThisIsland.com using the Cyprus Events Application .